Because of the mentioned reasons, except during regular everyday walks, we also incorporate different physical activities during the day. In the morning, we exercise with children for 20-25 minutes and the exercise is aimed to activate the entire body. During the week, we alternate aerobic activities with pilates and yoga. 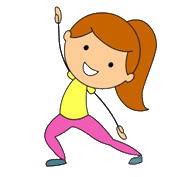 Aerobic Activities are realised through “action songs“, children move according to instructions which are sung in the songs (jump, run, clap, dance, … ) accompanied by a teacher, who serves as a model for movements. Pilates and joga Pilates and yoga are combined and realised through stories, music and games. Physically, children improve coordination, posture, mobility of the spine and joints, gain strength and flexibility. These exercises prevent children from back pain and neck pain and at the same time they learn proper techniques of breathing and relaxing. Stories, which accompany exercising, activate kids‘ imagination and sharpen their senses. Kids stay in each position just for a short time and all movements come in a logical sequence created by the story. Games help children to get involved in activities in the most natural way and music creates positive atmosphere of exercising. We use pictures, toys and work with rhythm. Generally, the organisation of a lesson is as follows: Warm up/song – 5 minutes, Story – 10 minutes, Relaxation – 5 minutes, Final activity – 5 minutes. Kids‘ exercising has its specifics. It should be fun and playful to make children interested and listen to instructions with pleasure. Lessons must have a flow. “Something must happen all the time.” We incorporate imagination, fantasy and abilities appropriate for their age. Positive attitude to physical activity positively affects not only their future health but also their future success in life. It is very probable that active children grow up to active adults.